On Saturday night we had the pleasure of hosting dinner for two young couples. Both couples were in their late 20’s. No children. One couple with a 2 year old cattle dog mix, the other was dog-less. They arrived at 4:00pm. I always wonder what people think when they come over to our house. Isn’t the saying “You never get a second chance to make a great first impression?” Let me tell you, that’s a hell of a lot of pressure for a parent with two small kids and two giant dogs! Once guests cross the threshold and through the Junior and Sulley welcoming committee, I wonder what they think about me, my family, and my home? Because no respectable person eating our food and drinking our beer would be honest if I asked them, I will give you a little behind the scenes look into my life on this day. Junior woke me up as usual with hot breath and a kiss on the face. I got up to find Sulley snoring on his back spread eagle beside the bed. Both reminiscent of Groundhog Day. Fed everyone and started the laundry. Big Barker Dog Bed covers and dog blankets are a top priority because, while they are cleaned regularly, they are magnets for dog hair and slobber. My husband went outside to mow the lawn and clean the pool, an all day job. That left me inside as General Manager or, as my two kids might say, Dictator In Chief. After breakfast, my son and daughter decided that since they rearranged their bedroom furniture last week, my husband and I needed our bedroom furniture rearranged. Forming an unlikely alliance and in utter defiance of common sense, they moved our King size bed and huge bedroom furniture all over the room, exposing that which I DID NOT have time to deal with – giant balls of dog hair, dusty walls and slobbery, dirty baseboards. Oh the Horror! Adding to the anarchy, my normally well behaved children also dismantled the Ginormous dog crate which was in our bedroom. While it rarely gets used anymore, I liked to have it there just in case. My philosophy is that you never know when you will need to crate your dog, dog sit a friend’s dog, or, I don’t know, get a third mastiff. These are all options when the crate is set up and ready to go. Sure that crate had turned into a shelf for miscellaneous items with no real home of their own, but it was my crate, and they dismantled it. And not by folding it as it was designed, but by taking every panel completely apart. Sadly, that dog crate puzzle laid mockingly in the middle of the floor by the kitchen all afternoon as I sanitized around it. My sweet husband was kind enough to clear the wreckage just before our guests arrived. My philosophy is that you never know when you will need to crate your dog, dog sit a friend’s dog, or, I don’t know, get a third mastiff. These are all options when the crate is set up and ready to go. I began my battle against the scourge of cleanliness; dog hair and mastiff slobber. Dog slobber alone doesn’t bother me. If it did, I wouldn’t own two mastiffs. Slobber is just slimy water. No big deal. Wipe it off. You’re clean. Water bowls stay outside and the laundering of strategically placed slobber rags around the house amounts to a full load every two weeks. We manage. I attempted to explain this to a woman Sulley and I met in a hotel elevator while on vacation in Colorado a couple years ago. Sulley greeted her sweetly as he does everyone and for three floors all he and I heard was, “ugh, gross! That’s so gross! Ugh! Ewww!” After about the third “ugh” I stopped apologizing and allowed just a little more lax in Sulley’s leash. All of that said, it is in these moments that I am quite impressed by how far and wide our dogs deposit their slobber. I find it in the crevasses of our cabinets, within the grooves of our textured walls, on doors, windows and even ceilings. And it’s not as if this was my first time doing the whole house wipe down either. I clean regularly. However, slobber is like dog hair. It is pervasive and it is everywhere. Dried on and cemented like super glue. With nail cutting knocked out the day before, the dogs’ bath was next on my To Do list. By this time it was at least 105 degrees outside. A seemingly perfect time for me to go outside and bend over in the hot sun for half an hour. Fortunately for me, Junior and Sulley love their baths and are good about standing patiently as I lather and rinse them. Because mastiffs have a short coat and Junior and Sulley go swimming daily, I don’t normally bathe them in the summer and I only bathe them quarterly during the rest of the year. This was our lucky day. I learned how to make bread a couple years ago. From the grinding of the wheat to the kneading and rising, I make bread. As someone whose domestic skills in the kitchen are limited to the Popcorn button on the microwave and the Perfect Turkey probe on our oven, I am very proud of this uncanny talent. The downside of perfecting something like this is that your family gets spoiled, guests start requesting it, and it starts to feel like a part time job. And so the four hour process of making bread began. After preparing lunch for everyone, I fed Junior the second half of his breakfast. For some reason this spoiled dog has decided he wants his food delivered to him three times a day, not just two. I’m convinced this is his way of reinforcing my subservience. Of course I complied. If you have read Big Dog Mom’s Most Glaring Weakness Revealed And It Will Surprise You, you will have an appreciation for how ubiquitous dog hair is. In fact, it is the sneakiest of all scourges of cleanliness because 80% of the time you don’t really see or notice it. But I know the truth. It’s there. It’s everywhere. I know this because my dust mop and vacuum expose it. In fact, on this particular day, I emptied out my vacuum three times. That is a lot of hair for two mastiffs who really don’t shed noticeably like many breeds do. But, like the slobber, the dog hair doesn’t really bother me. I tolerate it because I adore my dogs. With Go Time fast approaching, I got both kids dressed respectably and finally got my shower. Fortunately for me, the decision of what to wear when guests come over is not a major production for me as it is for some women. There are definitely days when I wish for a more fashionable attire, but with limits in our budget, I choose to spend money on my kids and my dogs. Someday I might create a little more wiggle room in our budget by selling pre-slobbered, pre-shedded on clothing. If Nordstrom’s can sell dirty jeans for $425, who knows how much people will pay for this dog-friendly fashion. That night I selected a pair of khaki shorts and a black tank top. Both were clean (sorry Nordstrom’s). Good enough for me. Our guests successfully made it over the threshold and were kindly greeted by the Junior and Sulley welcoming committee promptly at 4. While I am undoubtedly determined to control what I can control, I realize that our guests’ first impressions are not born entirely by the cleanliness of our home. My children are courteous and smart. My husband is generous and funny. Junior and Sulley could not be more endearing. And, despite the dry chicken breast and burnt rice, my bread is delicious. So, if you ever come over to our house for dinner, now you know the truth. The dirty truth behind what goes on at Big Dog Mom’s house before you get here. It’s my life. And I love it! 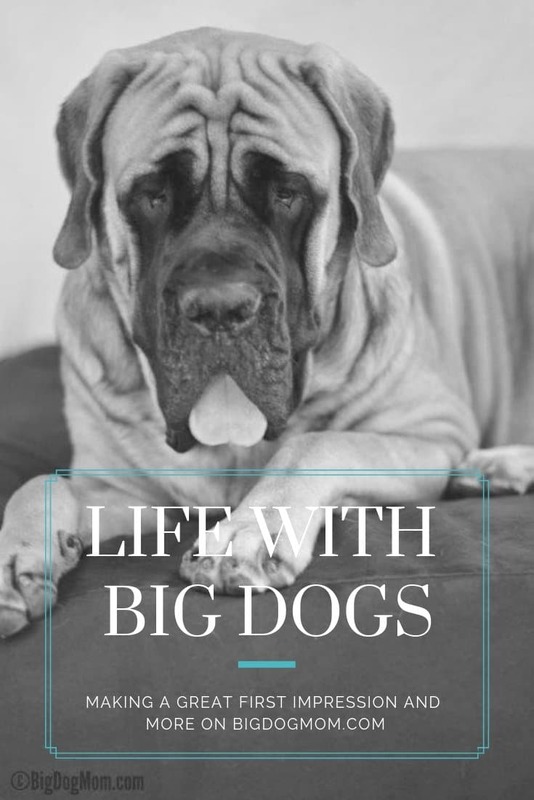 For more on our journey, read Life Lessons: What I Learned from an iPad, Flip Flops, and Two Big Dogs. With only one dog, and a small one at that, and two cats, I can totally relate! I stress enough having company over, it’s the perfectionist in me, but when you add pets into the equation, especially when your visitors are non-pet parents – well that just adds to the worry of wondering what they are thinking. I am slowly learning to relax more and I figure, if they agree to come visit, they know me enough that pets are just part of our family. But I do find it easier with company that has pets as well – the tend to “get it”. Oh, I agree completely, Kelly! Most of my friends are pet parents, but I still feel compelled to sanitize the house for some reason. It is the perfectionist in me as well. BOL! I *LOVED* this! You have me nodding and giggling (as I look at all the tumbleweeds of Husky fur under my TV and an apparently a well-licked screen, and my grandsons toys covertly tucked in one of their beds)! When guests come, we have a special “rake” to do a quick clean-up of our rugs and dog beds so the average person doesn’t get grossed out! Fortunately, they fall in love with all the Husky kisses, they don’t seem to mind the extra fur coat they leave with! And by the way, I’d LOVE an invite to your Big Dog House and some slobbery kisses from those beauties! (I may leave some Husky fur behind…since it’s on everything I own. Hope you don’t mind)! Hahaha! You are so funny, Dorothy! Thank you! You are right, all of this cleaning is really so that the average person isn’t totally grossed out… especially when that average person works with your husband. 🙂 You and your huskies would absolutely have to come for a visit if you are ever in AZ. They would be a flurry of hair and slobber for sure. Haha! It’s so good to know that there are others out there who fight the good fight against dog hair. In my case, it’s dog hair and cat hair both that waft through our house like gossamer memories of pets long gone. Vacuuming every other day simple keeps the volume of hair down without ever getting rid of it. Sometimes I’ll stumble upon (or over) a clump of dog hair that could be mistaken for a small puppy and quickly stash it in the nearest trash can. I will never have an immaculate house. But I do have two wonderful, furry pets I wouldn’t give up for the world (or even a spotless floor). I couldn’t agree with you more, Lori! Very well said! Haha! Oh yes, I am sure we have had our fair share of dietary hair as well. I can only imagine what it’s like with three Golden retrievers! Great idea on providing a warning to people before they come over! Thank you so much! The bf complains that I shed more than Mr.N! He jokes that one shedding being in the house is enough so shedding dogs are out of the question. What a lighthearted and smile bringing post! I would feel right at home at your house! Thanks for sharing your real life adventures. Here’s to pet hair and dog slobber! This is a fun and all-to-true post. I can normally keep my house fairly clean when it is just my cat and dog. But every time I add a litter of foster kittens into the mix, I also scramble to get the house “presentable” before company comes over. LOL. I am also challenged in the kitchen but am SO IMPRESSED you can make bread. This is something I would never even attempt. Of course, I am also impressed with the dog slobber and hair clean up, too. I enjoyed reading about your day…really made me feel lazy. So happy that you can smile when your family “helps” you. Thank you, Amelia. I find that a smile and a sense of humor go a long way, even in the most stressful of situations. I really loved this post. My chicken may also be dry, but I cannot make bread. So you’re one up on me! Haha! Well, I appreciate that. Thank you so much! Slobber is like dog hair — it helps you remember your dog even when you’re not together… Funny post! Terrific point!! Thank you so much! So funny. We have to do such a major clean up if we have guests coming as I work from home and am a little messy, plus Kilo the Pug sheds black hair all over our white sofas. I do love cooking but am just a bit overwhelmed lately so cut back entertaining. LOL What a crazy day. My favorite quote of all time “Slobber is like dog hair. It’s pervasive and it is everywhere. Dried on and cemented like super glue!” Yep I’ll be re-tweeting that one for sure! Haha! Thank you so much, Kamira! Getting dogs good and tired is one of the best way to manage any high-excitement situations. Once they get to drain all their excess energy, they are much more likely to behave and stay calm. Yes, I have found that to be true as well. Great tip, Jana! We have a fried coming from Arizona in December, I am starting to tidy up NOW as there is so much to do! You cope amazingly and I would never be able to do it like you do. You entertain! Plus you bake bread. I’m impressed! Sounds like your home is full of love, which is what counts. Reading about the chaos does make me think about my childhood and puts a smile on my face. Thank you, Irene! I hope my kids feel our home is filled with love. At the very least we have a great sense of humor and don’t take life too seriously.